After lunch Steve and I were discussing where we were going to take Hailey on her birthday next Tuesday. Steve's mom mentioned to us that there were some trains you could ride up at Griffith Park. Griffith Park is 4 times the size of Central Park in New York. There is plenty to do, so that is where we are going to take Hailey. We are going to take a picnic lunch, hit up the free train museum, ride and play on the trains, maybe ride a pony or the carousel, and hit up one of the seven huge playgrounds. I also told Steve that now that we are going to have an Evan boy, sometime in the future I would like Hailey and Evan to have a wooden train set to play with. I mentioned that I had heard there is a huge variety of different types and brands and that sometime we should check into it. Steve then told me his mom used to have an electric train that went around their Christmas tree until the boys broke it. And then he got this look in his eye. "What if we had an electric train built out of Legos?" I turned around to tell him something, but he was gone. A couple of minutes later Hailey and Steve came running into the house with a few tool boxes of Legos from the garage. Steve wanted to start building a train. It's true, Steve loves Legos so much that 2 years ago he got the Hogwarts Lego Castle from Santa. He still plays with his Legos sometimes; they even went to work with him one time. I believe everyone should have a hobby they enjoy. I am so glad he hasn't crushed my traveling dreams. He did take me to Dublin for my birthday one year, and in two months we are going to Italy for two weeks. In Steve's dream life he would have a Lego room all to himself. While that is not possible now I do support his Lego hobby. Thankfully we don't buy many Lego sets since Steve has so many from his childhood already he can play with (they get pretty expensive). Sometimes I think of all the children who have absentee fathers who just don't care about them one way or another. I am glad that Steve is super involved. When he plays with Legos so does Hailey. It is something fun they can do together. We consider this a win-win situation in our house and I encourage it. Steve would eventually like to collect the rest of the Harry Potter Lego sets. We looked up the Motorized Hogwarts Express. I was thinking to myself, "How much could this possibly cost?.... maybe $200?" Well on Amazon you can buy this train and a set of tracks for $749.99. Yikes! Of course Steve began to research how to motorize your own Lego trains for a lot less. 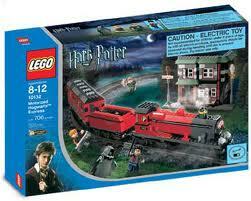 The ideal would be for him to find the regular Lego Hogwarts Express on eBay and motorize it himself. For about $60 you can buy all the pieces you need to motorize one train. 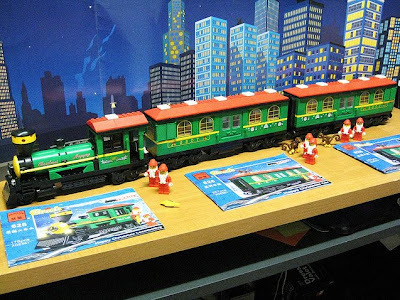 We think it would be fun to have 2 trains running around our Christmas tree. One Hogwarts Express and one Christmas train. Christmas is 10 months away so this seems doable. Steve and Hailey made a train, but we do not currently own any of the train-specific pieces. That prompted Steve to spend the rest of the day searching for Lego trains online. Two hours after our normal bedtime we were still up in bed scouring eBay for Lego trains. We did our taxes at the beginning of the month and have already received both our state and federal refund checks. While the majority of the money will be saved there will be a little contribution to the train fund. We made our first purchase for our Christmas train for 99 cents plus shipping around midnight. Around that time Hailey woke up and needed a drink. She walked into the living room to find a gazillion Legos all over the floor and was ecstatic! Time to play! And that's when I told everyone, "Go to bed! Now!"